St. Scholastica will host the 5th annual "Still I Rise" concert to benefit victims of domestic violence on Saturday, April 7. "Still I Rise: Songs of Struggle and Strength" is a collaborative concert featuring the collegiate women's choirs of St. Scholastica, the College of St. Benedict, University of Northwestern-St. Paul, St. Cloud State University, and the University of St. Thomas. The choirs will highlight the link between the arts, education, and social justice as they perform songs of struggle, strength, and empowerment. A free will offering will be taken, and all proceeds will benefit the Program for Aid to Victims of Sexual Assault (PAVSA). The concert will be from 3:30 to 5:30 p.m. Saturday, April 7 in the Mitchell Auditorium on the St. Scholastica campus in Duluth. This will be the third time that St. Scholastica has hosted the concert, which has raised more than $10,000 for community agencies since its inception. 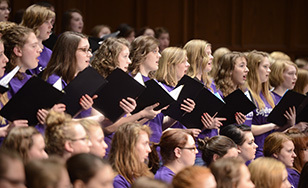 Dr. Bret Amundson, director of Choral Activities at St. Scholastica, said that the concert educates singers and audience members about the issues surrounding sexual and domestic violence. For more information, contact the Spotlight Box Office at spotlight@css.edu or 218-723-7000.